This Wellington-educated public schoolboy was always out to enjoy life to the full and never made the mistake of taking himself too seriously. James successfully shed his "Hunt the Shunt" sobriquet - earned through a succession of frightening F3 accidents - to graduate into the Grand Prix arena with distinction. Initially he grabbed the headlines with his exploits driving for Lord Hesketh's colorful independent F1 team and won the 1975 Dutch Grand Prix at Zandvoort by feet from Lauda's Ferrari. In 1976 he joined McLaren as Emerson Fittipaldi's successor and had a terrific season, battling back into contention for the World Championship after being excluded from his victory in the British Grand Prix. 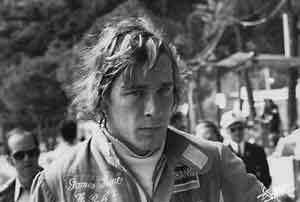 Admittedly aided by Lauda's temporary absence from racing following his Nurburgring accident, Hunt took the title challenge all the way to the final race at Mount Fuji where third place in torrential rain was sufficient to clinch his crown. It was the pinnacle of James's racing achievement. A gentle decline followed, leading to his eventual retirement in 1979. Thereafter he carved out a career as a TV commentator only to die prematurely from a heart attack at the age of 45.